Dear RV Doc, we are purchasing a used 2007 Winnebago with 16,000 miles. Unfortunately, it had been exposed to freezing temperatures and the water heater froze and cracked. The dealer replaced it. When installing the water heater, the water line from the engine (it has a motor-aid feature), was not tightened enough and the line gave out and it blew the engine, which was also replaced by the dealer. If nothing else goes wrong and the system is ready we are considering going through with the purchase. However, we are worried about the water system being stressed by the freezing temperatures. What tests do you suggest that have a decent chance of catching plumbing problems that are just waiting to show up? I am thinking of using higher than normal air pressure behind a filled water system. What water pressure should the system be able to handle? Michael L.
Michael, freeze damage to the fresh water plumbing system is indeed a concern and proper testing is paramount prior to finalizing your purchase. The formal testing procedures performed at the factory during manufacture included pressurizing the system (with air or water) to 80-100 psi for ten minutes. Typically, in the aftermarket, these same tests can be performed by any Certified or Master Certified RV technician using a specialty test device comprised of a gauge, a manual shutoff valve and special adapter that keeps the city water inlet check valve depressed during the test. Since the city water inlet employs a check valve that opens under incoming pressure, (typically between 1-5 psi), testing through the city water entry without using the blue specialty fitting could allow small leaks to go unnoticed, so it’s important the check valve be continually held open during the test. Here’s why; until enough pressure leaks from within the system to create a loss in pressure sufficient to open the check valve, no loss in pressure would be noticed on the gauge upstream of the check valve if it’s not held open. Air pressure is my preferred method in case leaks are abundant; no mess to clean up! In your case, it really doesn’t matter since the system probably still has water in it. The test fitting is attached directly to the city water inlet and subjected to 80-psi of clean compressed air. Remember, this is the fresh water system, so they should avoid using shop air, which could contain tool oils and contaminated moisture. In the not-so-distant past, the fresh system plumbing was tested at 100-psi, but the NFPA Standards now only calls for a minimum of 80-psi. If you have an icemaker, it is probably best to remove it from the system prior to testing in case the inlet valve is not designed for that much pressure. Check your owner’s manual to be sure. If no drop in pressure is noted after ten minutes, the coach is deemed sound. In your case, however, I would like to see a redundant test performed before and after a road test, just to be sure. And possibly extend the test to fifteen minutes, vice ten. I’d also have some type of rider written in case additional leaks develop later. It is important to note that when this testing is complete, residual pressure must be released through a faucet or low point drain valve to avoid damage to the check valve device. Backflow preventers/check valves are designed for directional flow and pressure induced in the reverse direction may cause O-rings to be dislodged from their seats resulting in a damaged product. It does take a technician with sufficient training to perform this test correctly! The test gauge can be inserted anywhere in the fresh water system; it’s just usually easiest at the city water inlet. 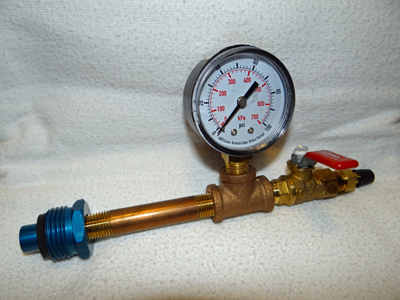 If an alternate location is used and it is necessary to tap into the system to insert the test device, those fittings will also have to be tested under pressure with a soapy solution once the test device is removed and the system fully pressurized and made functional. If you have any drop in pressure during the test, a leak exists somewhere. Soapy solution is applied to each fitting until the leak(s) are totally eliminated. If the leak is a crack somewhere along the length of a section of the tubing, further troubleshooting will be necessary to locate the crack and replace that section of tubing. Remember, a new test should be run after replacing any component until the test proves there are no leaks anywhere in the entire fresh system!